.Celebrate the 100th day of school in this adorable T shirt. Happy 100 days of school!! 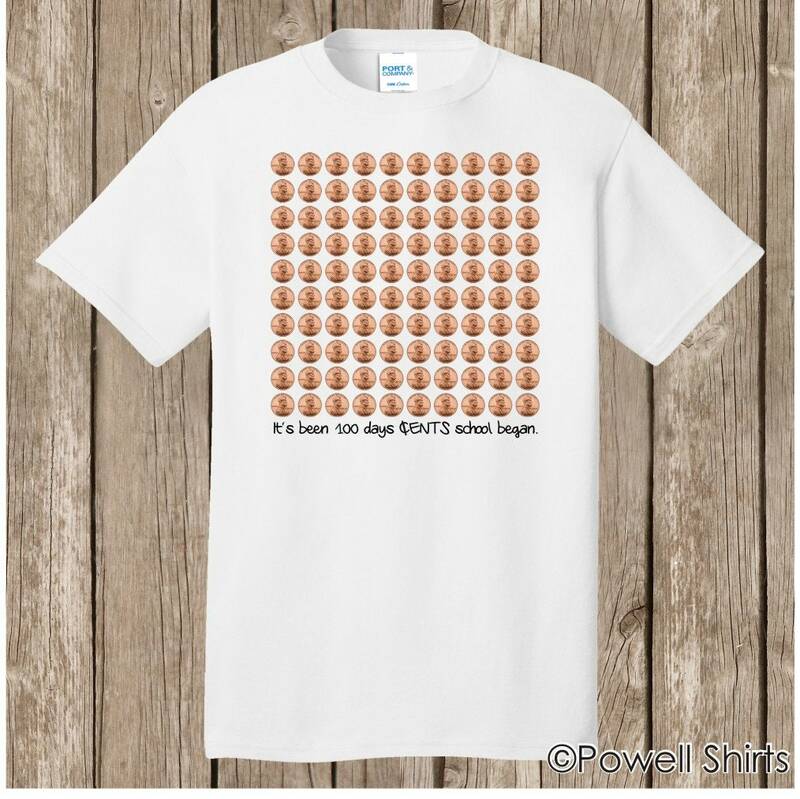 This shirt features 100 pennies and has the text - "It's been 100 days cents (with the c as a cents symbol) school began"
Available in adult (up to 6X), youth, infant and toddler sizes as well!! Please see included size charts or email any questions. - but again - this is contingent on note about about our having your shirt color in stock. In other words, this is for quicker shipping, but if we don't have your shirt in stock, it will take us 5-7 business days to get it in stock. PLEASE BE SURE TO READ AND CONFIRM the shirt measurements below. These shirts are "made to order", and we cannot accept returns if you order the wrong size. REFUNDS will not be offered unless we cannot ship your shirt in the time frame outlined here (the "ready to ship date" to the right under shipping and returns) or there is a defect in the workmanship in which case, the unworn and unwashed shirt will need to be returned to us for our review. High quality Port & Company brand 100% preshrunk cotton printed (not pressed on) T shirt. Other shirt colors may be available upon request. If you are interested in a different shirt color, please ask before you order.